In other news, we finished painting the floors in the studio this weekend!! I used the pre-mixed white Rustoleum enamel and rolled on the paint in a really thick coat – no primer or top coat necessary. I LOVE how glossy it is! The fabric shelves in the studio are almost all organized too and we’ll be sending out special textiles to be made into pillows to sell on the new site (or at least that is the plan). There will be some made out of the fabrics that I only had small quantities of, but I also like the idea of using found textiles to make pillows too. I used a vintage serape blanket to make a bolster pillow for the daybed in the library and I really love how it turned out. 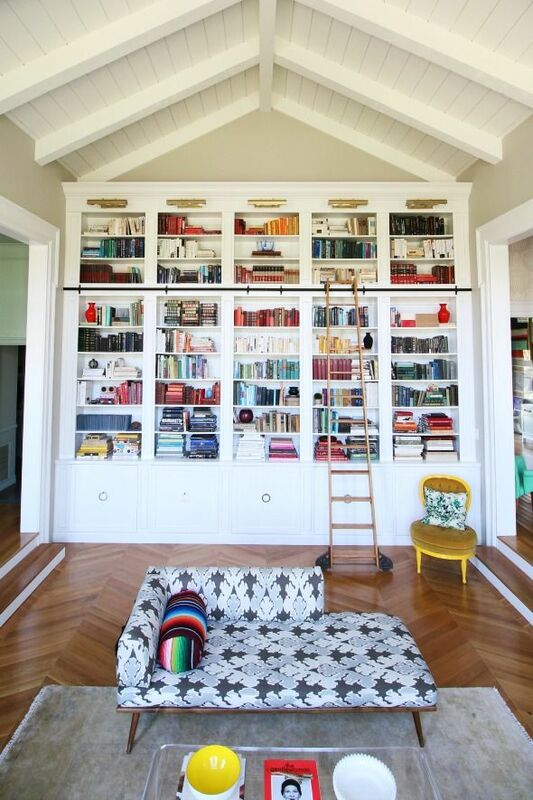 It’s such a fun piece of the design puzzle of these rooms that are all open to each other. 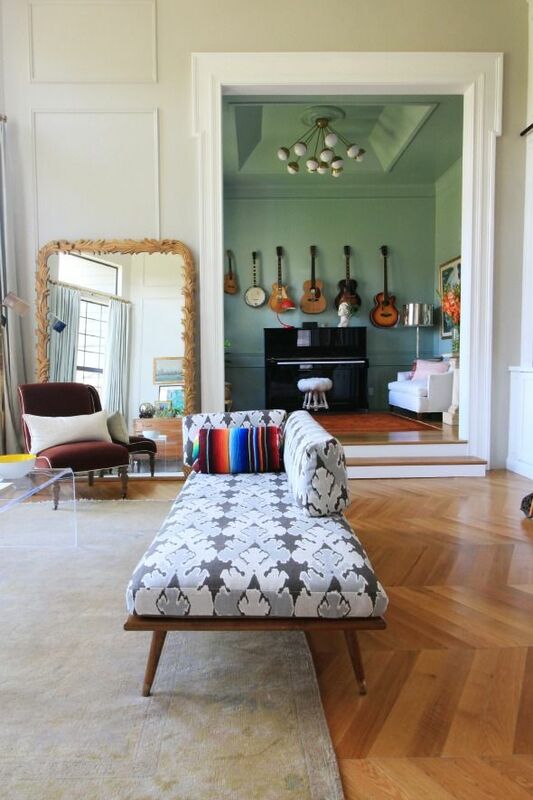 I’m so happy with how the colorful striped pattern of the serape mixes with the neutral color but big pattern of the Bengal Bazaar linen on the upholstery. Plus, I think you just can’t go wrong with a good bolster pillow! I love the oversized shape. I picked up the fluffy down insert on sale at West Elm for just a few dollars last year. It’s a good one. A little note though (in case you want to try something similar yourself). With woven textiles like a blanket, you’ll want to iron on a fusible backing to help keep the fibers together, since the weave is not really meant to be cut. You can find the inexpensive iron-on backing at Joanns or pretty much any fabric store. PS – How to sew a pillow in jut a few minutes! 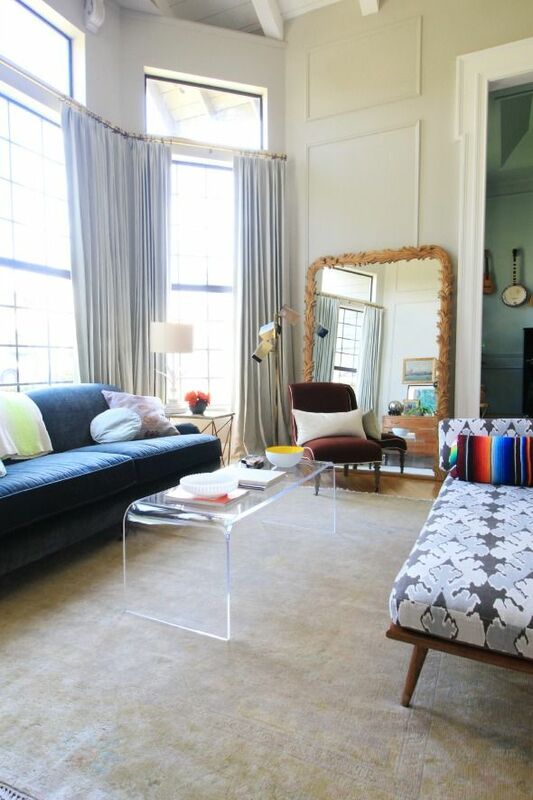 I'm also loving your rug here – would love to see a post of advice on how to choose a rug! My husband and I just bought a new house with gorgeous hardwoods, but we need rugs and it's turning out to be so hard (this is a good problem). Any advice would be hugely welcome! Congratulations again on baby girl and other developments! A friend of mine introduced me to your blog and i love it :) Any words of advice for someone looking to get into interior design? Great advise about the interfacing! 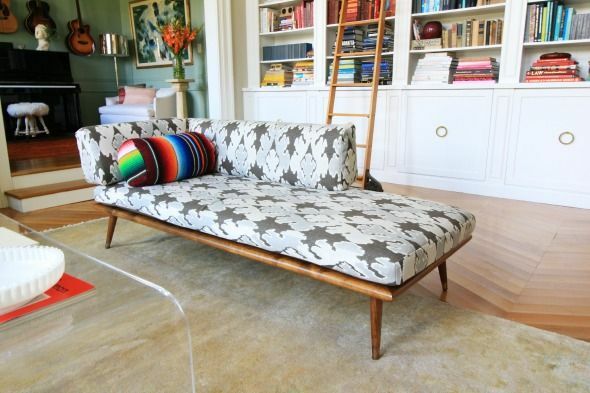 The daybed ended up looking so cute (the back looks amazing painted…before it looked like it needed to back up to a wall)and I love how you made the unexpected choice to run the pattern along the length of the couch. Really smart. I am so glad to hear you are not going anywhere soon! 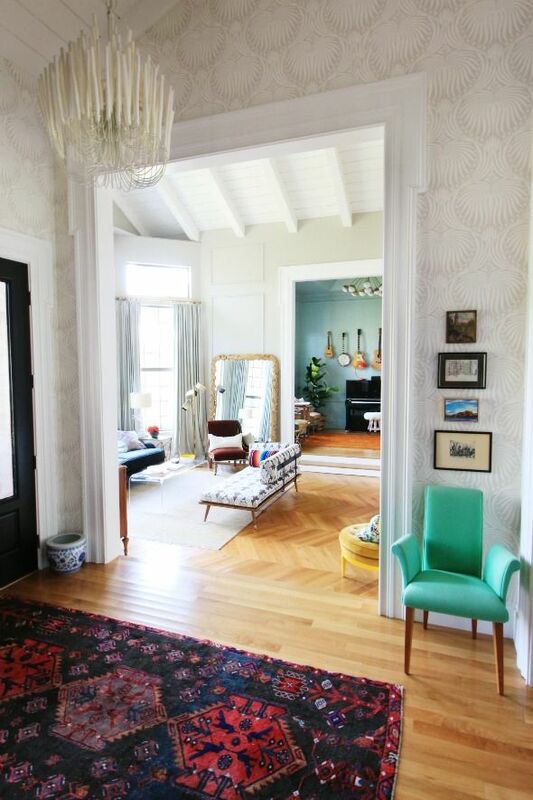 I totally love gawking at your house/design/diy!! Love all things serape! 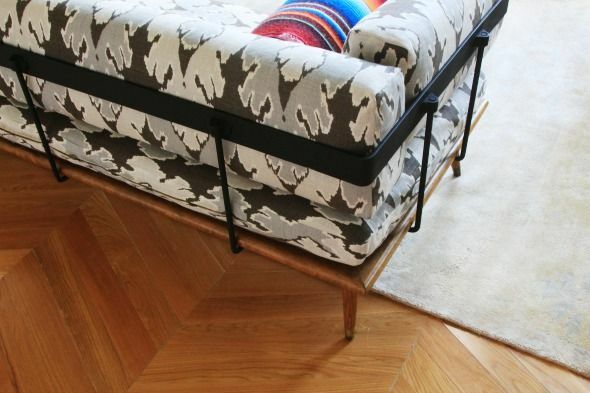 And wish I'd known about the tip to line those textiles…I made an upholstered ottoman recently using a mexican blanket, and it could use a little stiffness. Okay, question, and if you've answered it already, forgive me. Did the white washed studio floor not hold up well or did you just change your mind to wanting a glossy white? Can't wait to see pics. I'm so glad you added the comment about reinforcing serape fabric. 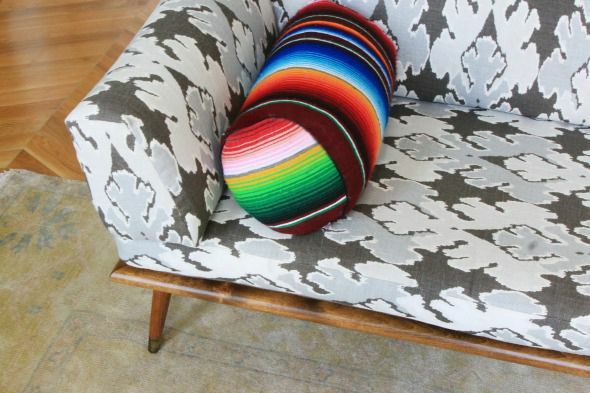 I made some oh-so-charming serape pillows … very quickly they pulled apart at the seams. Next time I'd re-inforce as suggested and maybe also add seam tape to take the stress at the seams. 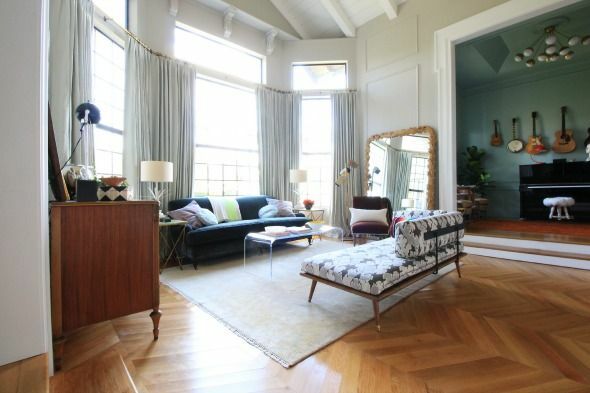 Such a lovely and inviting space! 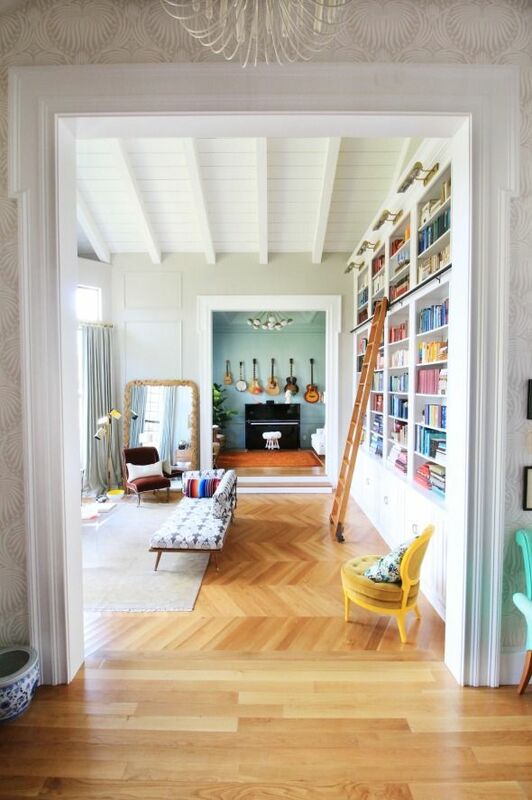 I love your use of color, pattern and the physical architecture of the space to really create a seamless design and welcoming home! Congratulations! I will never give up on you, I'd just selfishly be very, very sad if you ever gave up the blog! I love watching your house (and your family) grow and change. You are one of the most creative people and definitely write THE best blog I've ever stumbled upon. I know you are incredibly busy, but I would love to see a blog post on maternity clothes! I am also pregnant and think you dress so cute. I'm so in love with your mirror! Congrats Jenny! Can you please tell us where you snagged the beautiful silver lamp that's in your music room by the piano? I've been looking for something just like it. Thank you! So smart- lining the looser weave. I'll definitely be tucking that away for future projects! Glad you're sticking around! I do hope to see more of the work you did to your whole house, because I'm sure it is just as beautiful as what was featured in Domino, and they did not show enough! On another note, I noticed the rug in your library that was in the Domino spread was different than the one shown here in these pictures. Could you share where that green one was from? Something like it, with those colors-ish, is exactly what I have been looking for! So pretty and congratulations on the news. One Big and One (literally) Tiny Announcement!! The Entry – Almost Done!